It is hard to believe that I am approaching my first anniversary as Director of Sales for Newby Realty. It has been an exciting and challenging learning experience. Newby Realty is a partner of Newby Management, which manages nearly 40 manufactured homes in the State of Florida. Newby Management has stewardship of all-age family communities and 55+ communities. The majority of these communities are land-lease, however, some of them are resident-owned communities. The goal of Newby Management for each of its communities is ‘100% Occupancy’. This means that it is Newby Management’s stated aspiration to manage in such an effective and diligent manner that every vacant lot will have a home, and every home will have an occupant. Our goal at Newby Realty is to assist Newby Management in reaching its goal of ‘100% Occupancy”. In order to achieve this goal, we also recognize that it is our responsibility at Newby Management and Newby Realty to continue to encourage our community owners to maintain and upgrade the community’s grounds and facilities on an on-going basis. One of our communities in Ocala just recently completed a $6 million dollar capital improvement on its pools and community center. Another $3 million project was completed in Sarasota this year.There have been many other community improvements this year throughout the Newby Management Portfolio. As a realtor, I have worked in real estate, both commercial and residential, for several years. There are many similarities in marketing manufactured homes and real estate. However, there are differences, for instance, manufactured homes have titles like vehicles. Usually, the buyer purchases the manufactured home in one of our communities and then pays lot rent. Of course, the exception is in resident-owned communities where a share in the community can be purchased. This is treated as a real estate transaction. One of the most exciting things that I have discovered in my first year at Newby Realty is the quality, variety and choice available in new manufactured homes. It is simply amazing. The homes are built so well and offer multiple choices in colors, floor plans, appliance packages, and pricing. This past year our Newby Realty team has placed over 25 new homes in our communities. These new homes have been placed throughout Florida in Newby Managed communities, such as, Fort Pierce, Winter Springs, New Smyrna Beach, Edgewater, Debary, Ellenton, Bradenton, Sarasota, Ocala, and Tallahassee. We are in the process of ordering more homes for arrival in early 2016. For those who might be looking to spend a little less, many of our communities offer pre-owned homes for sale or rent. Also, we are finding more and more buyers want to custom a home to fit their exact needs and tastes. We are happy to accommodate that choice at Newby Realty. In short, if you are considering a move to Florida, I encourage you to check out our website and Newby Management.com and check out our properties. We are located in so many prime locations in the beautiful State of Florida. Welcome to sunshine paradise. 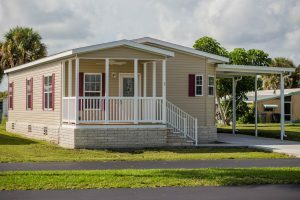 Today, buying a manufactured home is better than ever.In fact, owning a modern manufactured home isn’t much different than owning a site-built home, except you’ll pay much less. Plus, some manufactured home owners can take advantage of Florida’s homestead exemption. The Florida Department of Revenue states that a person who owns a property in Florida, and makes the property their permanent residence by January 1, is eligible for an exemption of up to $50,000. That means that if you own the land your manufactured home is on, and you own your manufactured home, you could save a lot of money. When you couple that with the low cost of manufactured homes, lower property taxes and homestead exemptions, you can get some great deals. The first $25,000 is exempt from all property taxes, including school district taxes. The added $25,000 applies to assessed value over $50,000 and only to non-school taxes. The value used to calculate your property taxes cannot increase by more than 3% annually once you receive homestead exemption. New 2015 manufactured homes are built with craftsman materials and professionals. You’ll find modern upgrades and stylish designs that you wouldn’t believe. Plus, these new homes are a fraction of the cost you’ll see for site-built new constructions. See amazing homes available at www.NewbyRealty.com.